Orsu Metals Corporation (TSX-V: OSU) (“Orsu” or the “Company”) is pleased to announce encouraging results from Phase 2 exploration program at its Sergeevskoe Gold Project in Russia. 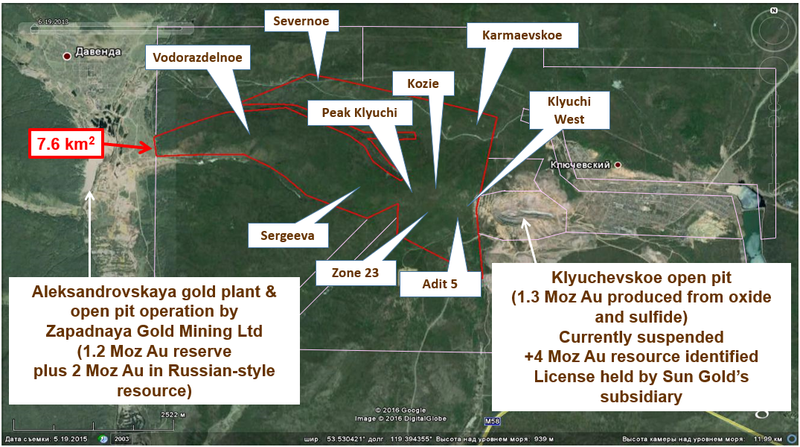 The license of the Sergeevskoe Gold Project occurs immediately east from the Alexandrovskaya gold plant owned by Zapadnaya Gold Mining Ltd and to the west from the Klyuchevskoe gold license owned by Sun Gold Mining (Figure 1). Klyuchevskoe (Klyuchi) gold deposit represents a +6 Moz gold endowment (see Orsu press-release dated September 21, 2016). Orsu currently owns an indirect 30% interest in the Sergeevskoe Gold Project, however the Company is currently in the process of acquiring an additional 60% interest for a total interest of 90% (see press release November 6, 2017). Orsu has been conducting Phase 2 exploration program at the Sergeevskoe Gold Project since June 2017. The Phase 2 works at the Klyuchi West and Kozie Prospects included a 1159.5 m trenching and 1053 m drilling program (Figure 2). The program consisted of six bulldozer trenches at Klyuchi West near the eastern boundary of the Sergeevskoe license and nine bulldozer trenches across Kozie inside the Sergeevskoe license. These prospects were selected for Phase 2 trench testing on the basis of Phase 1 trenching results by Orsu (see Orsu press-release dated June 5, 2017). Prior to trenching and drilling, Orsu completed a pole-dipole induced polarization survey (“PD-IP”) down to a depth of 500 m and gradient array chargeability and resistivity surveys over the entire Sergeevskoe license area, conducted by OOO Tien Shan Limited, a Kyrgyzstan-based contractor, which is independent from Orsu. Figure 2. Position of completed trenches and drillholes at the Klyuchi West and Kozie Prospects, Sergeevskoe Gold Project. The mineralization consists of quartz-tourmaline-sulfide veinlets, forming linear stockwork zones controlled by contact zones of diorite and hybrid porphyry dykes intruded into granite to porphyrytic granodiorite intrusions and magmatic breccia bodies extending for approximately 1000 m from Kozie to Klyuchi West. The stockwork zones generally strike to the northwest, with trenches designed to intercept them in perpendicular to oblique directions. The style of mineralization can be best classified as intrusion-hosted gold. At Klyuchi West, six bulldozer trenches have been driven, of which three trenches (S10TR17-7, S10TR17-13 and S10TR17-14) were excavated along the 75 m strike length (Figure 3) of high-grade mineralization previously intercepted in trenches 17-1042 and 17-1025 (see Orsu press-release dated June 5, 2017). Three other trenches (S10TR17-15, S10TR17-16 and northern part of S10TR17-18) have been driven in the south to the north direction to close the gap between Zone 23 and Klyuchi West. Selection of mineralized intervals is based on a 0.5 g/t Au cut-off for compositing, with maximum 2 m length of 0.3-0.5 g/t Au mineralization included into mineralized interval. Composited intervals in new trenches are presented uncapped (Table 1). Trench S10TR17-7 was driven over 42 m, some 10 m northwest from trench 17-1025. It intercepted a linear oxidized quartz stockwork in granite in almost perpendicular direction. The newly intercepted mineralized intervals returned (from the south to the north) 0.64 g/t Au over 7 m, 0.65 g/t Au over 2.8 m, 2.71 g/t Au over 12.1 m, and 1.51 g/t Au over 3 m.
Two cross-cuts were driven in perpendicular direction to trench S10TR17-7 towards the east-southeast constrain the orientation of the stockwork at 340NNW. 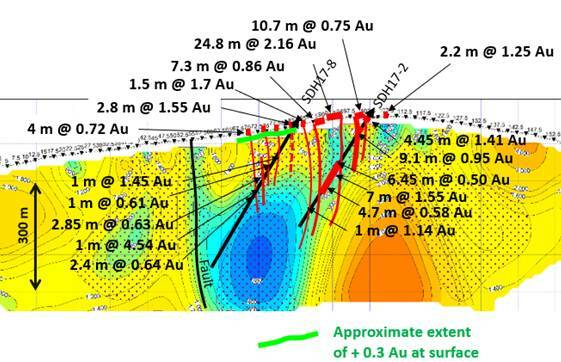 The cross-cut S10TR17-7/2 intercepted 12.73 g/t Au over 7.3 m.
Trench S10TR17-13 was driven over 43.5 m, some 13 m northwest in subparallel direction to trench S10TR17-7. It also intercepted a linear oxidized quartz stockwork in almost perpendicular direction, although it is hosted here in porphyritic granodiorite. The newly intercepted mineralized intervals returned (from the south-southwest to the north-northeast) 0.6 g/t Au over 4 m, 0.65 g/t Au over 16.8 m, and 1.51 g/t Au over 5 m.
Trench S10TR17-14 was driven over 38 m, some 60 m southeast from trench S10TR17-7. It also intercepted a linear oxidized quartz stockwork in granite in almost perpendicular direction. The newly intercepted mineralized intervals returned (from the southwest to the northeast) 0.94 g/t Au over 0.7 m, 1.35 g/t Au over 1.4 m,suggesting that the mineralization becomes apparently weaker towards the license boundary. It remains open in northwestern direction and its extent requires further investigation. In trenches S10TR17-15, S10TR17-16 and northern part of S10TR17-18, the quartz-tourmaline veins with gold mineralization are also hosted in granite. They represent two more stockwork clusters of similar nature to trenches S10TR17-7, S10TR17-13 and S10TR17-14. Trench S10TR17-15 was driven over 60 m. It intercepted a linear oxidized quartz stockwork in granite in almost perpendicular direction. The newly intercepted mineralized intervals returned (from the south to the north) 0.76 g/t Au over 6 m, 1.49 g/t Au over 4 m, 0.52 g/t Au over 2 m, and 0.54 g/t Au over 3 m. It remains open in northwestern direction and its extent requires further investigation. A drillhole SDH17-3 was drilled southwestward at 65 degrees to test the deep extension of mineralization in the above-described trenches. SDH17-3 intercepted 0.68 g/t Au over 17.1 m, 0.72 g/t Au over 7.95 m, 1.5 g/t Au over 11.95 m, 1.12 g/t Au over 4.55 m, 0.85 g/t Au over 2.45 m, 1.68 g/t Au over 8.35 m, 4.23 g/t Au over 5.15 m, and 1.1 g/t Au over 2.5 m (Figure 3; Table 1). Figure 3. Mineralized intercepts in trenches (S10TR17-7, S10TR17-15, S10TR17-16, SKZTR17-20) and drillholes (SDH17-3 and SDH17-7), with subvertical interpretation of mineral zones plotted against the west-looking PD-IP resistivity (Ohmm) section at the Klyuchi West Prospect, Sergeevskoe Gold Project. Note position of mineralization within only partly drill-tested large low-resistivity anomaly. See text and tables for description of individual intercepts. Several closely-spaced mineralized zones appear to be subvertically oriented in between the two dykes, confirming the extent of mineralization to a depth of 150 m, with potential downdip extension for additional 100 m to 730 mRL, explored in underground workings in Soviet times (Figure 3). It is Orsu’s understanding that SDH17-3 intercepted all intervals of S10TR17-7 and northern part of S10TR17-15. Table 1. 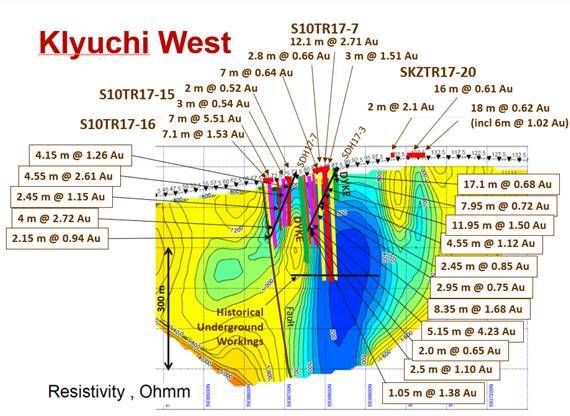 Mineralized intercepts in trenches and drillholes at Klyuchi West (above 0.5 g/t Au cut-off). Trench S10TR17-16 was driven over 33 m. It intercepted an oxidized quartz-tourmaline stockwork in granite. It intercepted two mineralized intervals (from the south to the north): 1.53 g/t Au over 7.1 m (including 2.8 g/t Au over 3.3 m) and 5.51 g/t Au over 7 m, striking to the northeast and northwest, respectively. The change in strike of mineralization suggests a non-linear orientation of stockwork at this particular location. The northern part of trench S10TR17-18 (from 130 m) was driven over 83 m in parallel direction to S10TR17-16, some 55 m to the east. It intercepted several short intervals with oxidized quartz-tourmaline stockwork in granite (from the south to the north): 0.89 g/t Au over 1.0 m, 0.94 g/t Au over 1.9 m,2.8 g/t Au over 3.0 m, 9.68 g/t Au over 0.8 m, and 4.82 g/t Au over 0.8 m, all striking to the northwest. This orientation suggest that the mineralized intervals do not correspond to those intercepted in SKZTR17-16, rather representing subparallel zones (Figure 2). A drillhole SDH17-7 was drilled southward at 64 degrees to test the deep extension of mineralization identified in trenches S10TR17-16 and S23TR17-18. SDH17-7 intercepted several mineralized intervals, with better intercepts of 1.26 g/t Au over 4.15 m, 2.61 g/t Au over 4.55 m, 1.15 g/t Au over 2.45 m, 2.72 g/t Au over 4.0 m (including 7.82 g/t Au over 1.05 m), and 0.94 g/t over 2.15 m (Table 1; Figure 3). The drillhole appeared to have stopped in mineralization. Similarly to hole SDH17-3, the mineralized veins are interpreted as subvertical zones, striking to the west-northwest. They also correspond to the low-resistivity anomaly (Figure 3), which appears to be only partly drill tested. At Kozie, nine trenches have been driven from the south to the north across the poorly-oxidized quartz-tourmaline-sulfide stockwork, occurring in the porphyritic granodiorite intrusion and hydrothermally-altered magmatic breccia post-dating the porphyritic granodiorite. The mineralization is controlled by the contacts of diorite porphyry and hybrid porphyry dykes, post-dating both the granodiorite intrusion and magmatic breccia. Auriferous quartz-tourmaline-sulfide mineralization was trenched along 800 m of west-northwest strike length. At Kozie, the individual mineralized zones are arranged in en echelon fashion within the broadly west-northwest striking cluster (Figure 2). Hole SDH17-2 was drilled to test the downdip extension of mineralization. Hole SDH17-8 was drilled to test the low-resistivity geophysical anomaly to the south of Kozie. Most important trench and drill intercepts are described below, while detailed trench intercepts are listed in Table 2. Trench SKZTR17-2, excavated some 90 m east from the previously reported trench 17-752 (see Orsu press-release dated June 5, 2017), intercepted several mineralized intervals (from the south to the north): 0.52 g/t Au over 1.0 m, 0.71 g/t Au over 1.8 m, 0.76 g/t Au over 6.0 m, 3.37 g/t Au over 8.5 m, 2.13 g/t Au over 11.0 m, and 0.97 g/t Au over 2.5 m.
Drillhole SDH17-2 was drilled southward at 65 degrees to the surface to a depth of 329.65 m underneath trench 17-752. It obliquely intercepted several intervals of: 1.41 g/t Au over 4.45 m, 0.95 g/t Au over 9.1 m, 1.55 g/t Au over 7.0 m, and 0.58 g/t Au over 4.7 m (Table 1). They correspond to the mineralized intervals in trench 17-752 and dip to the south at variable angles of 70 to 85 degrees (Figure 4). The mineralized intervals of variable width were additionally intercepted in the other trenches to the east from trench SKZTR17-2, spaced 60 to 90 m (Figure 2, Table 2). For instance, trench SKZTR17-12, excavated some 250 m east from SKZTR17-2, intercepted (from the south to the north) 0.68 g/t Au over 2.1 m, 2.14 g/t Au over 5.7 m, 1.33 g/t Au over 4.0 m, 1.2 g/t Au over 1.8 m, and 0.61 g/t Au over 2.2 m.
Trench SKZTR17-11, excavated some 400 m west from SKZTR17-2, intercepted (from the south to the north) 0.53 g/t Au over 3.0 m, 6.26 g/t Au over 5.0 m, 0.63 g/t Au over 1.0 m, 1.33 g/t Au over 1.4 m, and 0.72 g/t Au over 3.0 m.
Figure 4. Mineralized intercepts in drillholes SDH17-2 and SDH17-8 and interpretation of mineral zones plotted against the west-looking PD-IP resistivity (Ohmm) section at Kozie, Sergeevskoe Gold Project. Surface intercepts are shown for trench 17-752 as per Orsu press-release of June 5, 2017. The mineralization remains open to the west. In the east, it is limited by the Sergeevskoe license boundary. To the south, a drillhole SDH17-8 was drilled southward at 65 degrees to a depth of 399.65 m. Similarly to Klyuchi West, Orsu aimed to test the deep low-resistivity anomaly, above which numerous short auriferous intervals were intercepted in trench SKZTR17-1 (Table 2). SDH17-8 was sampled selectively from the visually recognized veinlet style of mineralization. The hole intercepted only short mineralized intervals in its middle part, corresponding to similar intervals in trench SKZTR17-1 (Figure 4), demonstrating no principle changes with the mineralized intervals at surface. The veinlet zones occur within the wide envelope of hydrothermally altered rock bearing ca 0.3 g/t Au immediately above the central part of the low-resistivity anomaly, which requires further analysis. The lower half of hole SDH17-8 does not bear visually recognizable mineralization and remained unsampled. Table 2. 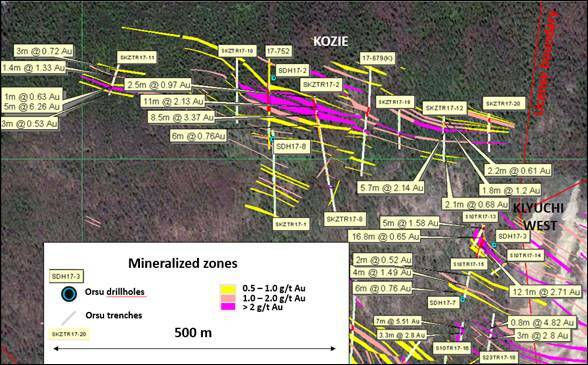 Mineralized intercepts in trenches and drillholes at Kozie (above 0.5 g/t Au cut-off).